World WBC champion, Deontay Wilder will be facing his toughest test to date when he defends his crown against the skillful and hard hitting Cuban Luis Ortiz. The fight will take place at the Barclays Center in New York. The challenger has an impressive 27-0 record with 23 of them by knockout. But records can be deceiving! Two of his victories have been as a result of disqualifications so he may hit harder than what his resume suggests! His style may not exactly cause people to be in awe but he is good at setting distance and cutting off the ring. Ortiz does tend to paw out the jab rather than use it as an effective weapon to grind down opponents. For him, it is seemingly a range finder in order to land that huge punch to settle the matter. Luis Ortiz has much technical ability. 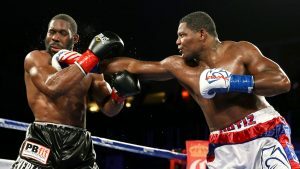 It has been shown by boxers such as Bryant Jennings that Ortiz isn’t particularly comfortable fighting on the inside and prefers to have space to get off his punches. But he does have reasonable footwork when he uses it. Which is to say, he does not much. However, with a soft, stocky build and weighing around 240lb, Ortiz possibly cannot constantly move around without it wearing him down. But he is patient and is willing to wait until the opportunity presents itself to stop the opposition, and as he proved against the likes of Tony Thompson, all it takes is one hit to put his man down. Like a cobra, his opponents need to be wary of that single lethal sting! While Ortiz was busy working his way up the ladder, prize winner Deontay Wilder has not exactly had it easy since becoming world champion in 2015. In his first defense against Eric Molina he was found with ease and rocked throughout, which is thrilling for the audience, but not good if you want to prolong your boxing career. He has had continuous problems with the likes of Artur Szpilka before finding the punches to retain his belt. Wilder keeps his hands low often and edges forward, throwing hooks and uppercuts mainly upstairs. He is quite reckless in his approach although he showed against Bermane Stiverne that he can perform methodically if he chooses to. He dominated Stiverne with the jab and picked his openings well, choosing not to force any knockout and found satisfaction with a points win. 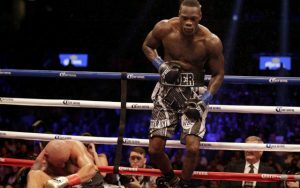 Deontay Wilder has come through many scary moments to retain his belt. Wilder will have to bring that same kind of mindset against Ortiz otherwise he could find himself outboxed and possibly stopped midway, especially if Luis can take his power. Inevitably, Wilder will pound on him at some point and we need to see if Ortiz will still be standing, as his punch resistance has not yet really been tested. Regardless, Deontay could still be facing a huge storm since he has had issues with lesser fighters! The fact that Ortiz is also a southpaw may very well add to his problems. The eventual winner may go on to have a unification fight with Britain’s Anthony Joshua in the new year. Whether Joshua will be facing Wilder or Ortiz does not matter, as a fight with either would be enthralling! Let us hope that promotional and organisational complications do not arise to delay that match up for too long. Of course, Joshua also needs to successfully defend his crowns against Kubrat Pulev first in Wales in on October 28th. 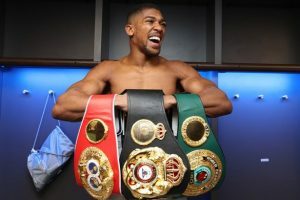 Anthony Joshua has the belts that either Ortiz or Wilder will want! The prediction here is that a portion of the championship will be changing hands on November 4th! Ortiz will just have too much technical ability that is all wrong for the incautious champion. Guarded advancement are the two words to describe the contender. He is intelligently patient but does enough to eventually come through. However, if Wilder isn’t eager to see Ortiz on his back, uses the jab while keeping his hands up and boxes then we could be in for a riveting experience. As you may well know that when it comes to the heavyweights, nothing is a formality.